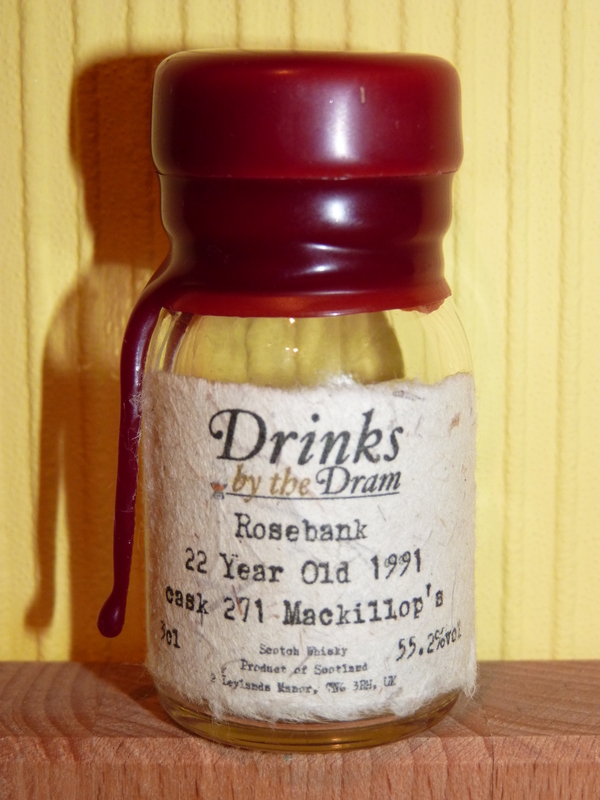 A 22 year old single cask from Mackillop’s distilled at the celebrated Rosebank distillery. Rosebank is of course a closed distillery in the lowlands whose whisky was triple distilled. Founded in 1798 and mothballed, never to reopen in 1993, this Falkirk distillery is extremely sought after. This bottling at natural cask strength was distilled in January 1991 and bottled in April 2013 after maturation in cask 271. What should have been one of my local distilleries but now sadly gone! I couldn’t resist the chance to try a Rosebank expression distilled on the banks of the Union canal in Falkirk, the distillery used to produce a Flora and Fauna bottling depicting the wild roses which grew so abundantly around the distillery site. This is a single cask expression distilled in 1991 and matured for 22 years before bottling at 55.2% cask strength as part of the Mackillop’s Choice range. A 3cl Drinks by the Dram sample set me back £13.55 for the latest release of whisky from this closed distillery. One of the saddest rumours I heard about the distillery was that there may have been some intention to re-open it until it was discovered that metal thieves had stolen the three stills for their copper value sometime around 2009. Malted barley, new make spirit. cereals, sweet fruits, floral violets, golden syrup, toasted vanilla, apricots, a new green vegetal aroma and yeasty smells reminiscent of distillery washbacks in operation. Warm buttered toast, a little prickle of spice and sour pink grapefruit pith or zest, deep Demerara sugar, caramel, toffee and a light treacle flavour all intermingled in a syrupy mouthfeel. From this expression I fear the loss of Rosebank is a very sad one. Although Glenkinchie still operates as the closest functioning [also Diageo owned] distillery I hold no love [yet] for its expressions. This Rosebank expression has huge depth, character and complexity and was an immensely enjoyable dram. It is likely that if any more Rosebank expressions do come onto the market they are going to be prohibitively expensive [at least for more than 3cl!]. At least there is some good news and their will soon be a distillery in Falkirk once again [see: The Falkirk Distillery] and I look forward to sampling what they produce. Here’s hoping it becomes a new rival to the near-legend that Rosebank whisky once was!